Ladders & Steps There are 3 products. 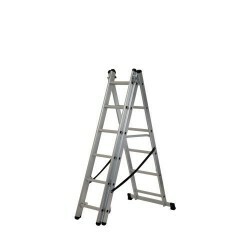 A handy 4 in 1 ladder that enables you to carry out a wide range of tasks. It is suitable for both professional and non-professional environments. A handy 2 Step Stepstool from ABRU to help you reach those just out of reach places. With a chrome finish and large rubber feet, it looks good and won't fall over when in use. The 1600E Telescopic ladder is easy to use, carry and store and is perfect for use at home, work, jobsite, caravan or anywhere you might need a ladder but cant take the traditional kind.